Not long ago, I failed miserably at practicing what I preach. I committed a very hurtful sin with my tongue, to which my wife responded, “Out of the heart, the mouth speaks.” She then told me what I already knew. My sharp words were a betrayal of my calling as a preacher, of my identity as a child of God, and of my dignity as a human being. Loathing myself, I asked my wife if she thought I was a fraud. How can someone who speaks like this call himself a pastor? How can someone who speaks like this presume to step into a pulpit and preach? It was the Wednesday before Easter. Why would God allow me, a preacher, to hit such a low? I think it’s because God wanted me to preach on Easter walking with a limp instead of a swag. When we preachers limp into our pulpits, God tends to do some terrific things through us. But when we hop up there with a swag, when we turn the pulpit into a pedestal or a stage instead of an altar, God loses interest in doing something meaningful through us. Anne Lamott once said, “It’s okay to realize you’re crazy and very damaged. All the best people are.” For me on Easter, Lamott’s words became a sorely needed lifeline. When you feel that you’re the most messed up person in the room and you’re also the one with the microphone, you need some serious help from the outside. And, by the mercy and kindness of God, that help came. Don’t ever forget that Moses stuttered and David’s armor didn’t fit and John Mark was rejected by Paul and Hosea’s wife was a prostitute and Amos’ only training for being a prophet was as a fig tree pruner. Jeremiah struggled with depression and Gideon and Thomas doubted and Jonah ran from God. Abraham failed miserably in lying and so did his child and his grandchild. These are real people who had real failures and real struggles and real inadequacies and real inabilities, and God shook the earth with them. It is not so much from our strength that He draws, but from His invincible might. I am praying that He will give you courage in this quality of His. God works mightily through the limp instead the swag. So, pastor, stay low. 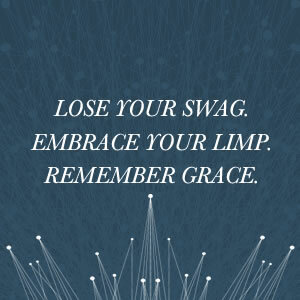 Lose your swag and embrace your limp…and then remember grace. Because that’s where all the true power is. Scott Sauls is senior pastor of Christ Presbyterian Church in Nashville, Tennessee and author of several books including his latest, Irresistible Faith. He writes weekly at scottsauls.com. Jesus said his followers would be a light to the world and a city on a hill–a warmly inviting, neighbor-loving, grace- and truth-filled destination for all. He envisioned his followers as life-giving neighbors, bosses, employees, and friends, the kind of people who return insults with kindness and persecution with prayers. Rooted in biblical convictions, they would extend love, empathy, and care to one another as well as to those who don’t share their beliefs. Over time their movement would become irresistible to every nation, tribe, and tongue. Irresistible Faith is a blueprint for pursuing this vision in our current moment, of redeemed individuals and a renewed community working for a restored world. This is a way of being that gives a tired, cynical world good reason to pause and reconsider Christianity–and to start wishing it was true.